It seems like everyone and every brand sends emails. And, it appears the quantity of emails is only going to increase over time. So, for better or for worse, emails and email marketing is a part of our future. We share new market research from our Email Marketing Survey 2016. The report includes three case studies that give life to our data and highlight best practices. If you’re seeking to improve your email marketing strategy or even simply looking for inspiration about how to format your newsletter, find content, or customize distribution times, this article is for you. It’s always best to learn from the example of others. Email newsletters are the email marketing norm for most large businesses. 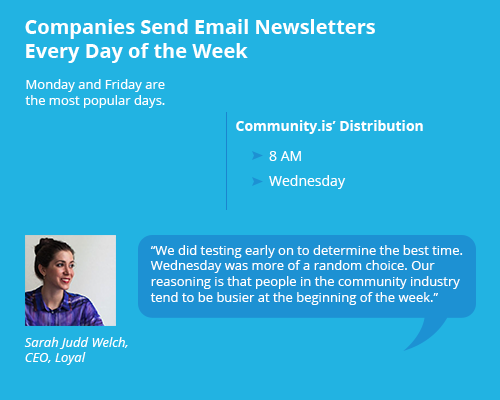 The most popular days to distribute newsletters are Monday and Friday between 9 and 11 AM. 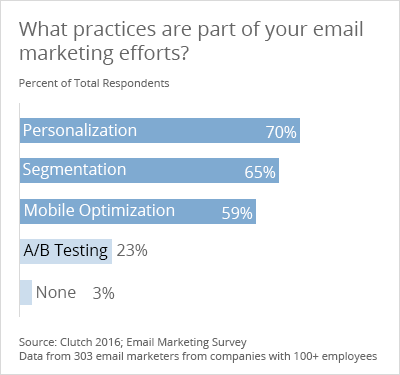 Most marketers (70%) say personalization is a key part of their company's email marketing efforts – more so than segmentation, mobile optimization, and A/B testing. From texting, to iMessage, to Gchat, to Slack, how we communicate with friends, peers, and coworkers continues to evolve. But email remains dominant in the workplace, serving as a means of communicating between not only individuals but also organizations and their constituents. 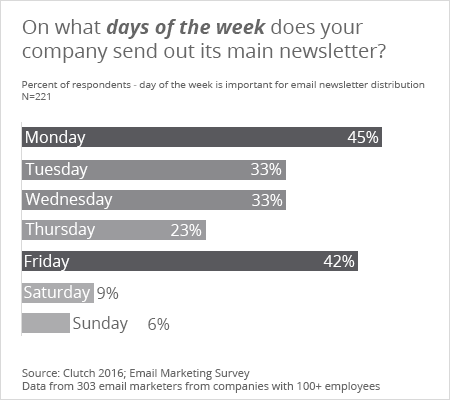 In particular, medium and large companies favor email newsletters. 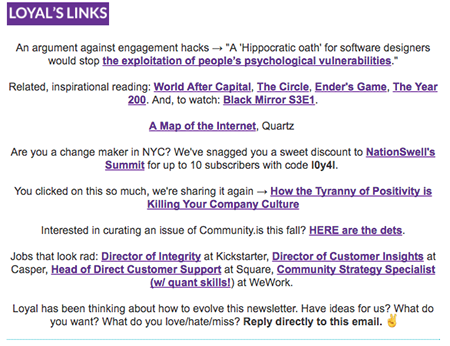 Let’s take a look at how three different organizations create and distribute their newsletters. Our case study lineup includes a small, community agency based in New York City, an interactive content marketing software company, and a volunteer-based group that caters to young adults in Washington, DC. Loyal, a community and customer experience agency, creates and distributes the popular newsletter, Community.is. Community.is’ goal has evolved over time. At its inception in April 2013, Community.is served to “educate and inspire people about community,” said Sarah Judd Welch, CEO and Head of Community Design at Loyal, a community agency. Over the past three years, Community.is matured into a thought leadership experiment in the community industry. “We’re more focused on how Community.is contributes to the conversation around community as a whole and how it reflects on Loyal as a brand,” said Welch. 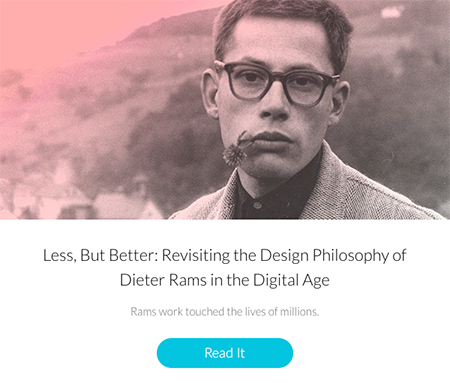 A content marketing software company that helps brands design interactive, engaging content, Ceros pursues three different email strategies: a weekly newsletter, a lead nurturing program, and one-off messaging. 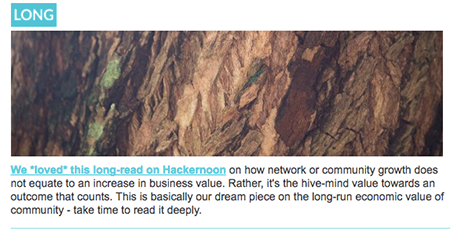 The newsletter is unique because its primary goal goes far beyond simply driving leads. It aims to educate. A volunteer-based project, 730DC distributes a daily newsletter to keep DC’s young adults informed about local politics and events. However, while timing is important, no universal rule exists regarding email newsletter distribution. Organizations should coordinate when they send their newsletter based on their audience's online behaviors and preferences. 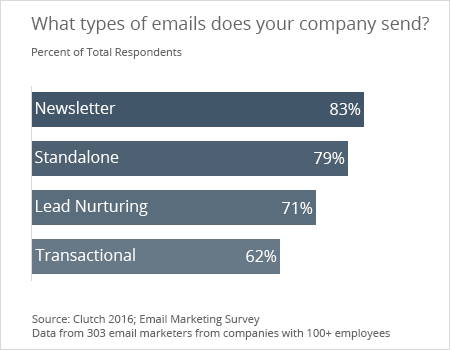 All three organizations demonstrate the importance of not only consistency but also audience specificity in the email newsletter distribution process. To a certain extent, each newsletter aims to reach its readers at a time that’s most convenient for them. Of the three organizations, Ceros’ strategy is the most refined example of tailoring send times to its audience. They use the tool, Seventh Sense to automate when an individual receives a newsletter. 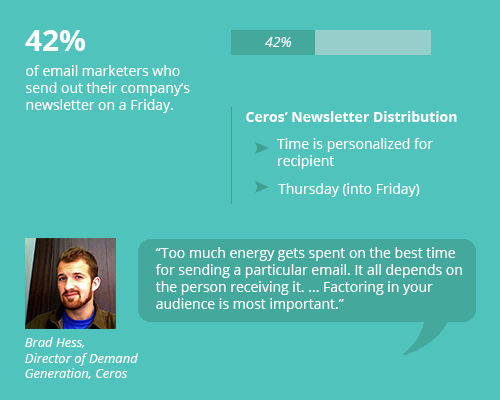 Ceros ' approach is an example of personalization, a process that 70% of email marketers do. 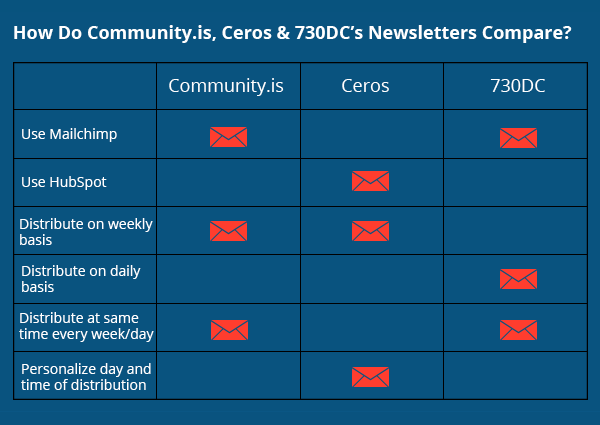 Let’s take a look at how Community.is, Ceros, and 730DC get personal with their audiences. Each week’s topic is introduced with a short reflection that always ends with an invitation to share your thoughts. For readers who are pressed for time, Welch breaks up the newsletter into short, medium, and long reads, with an additional section called “Loyal’s Links,” for those who want more. Each message contains four articles that connect to the week's overarching theme in some way. However, instead of sharing content from other sources, Ceros includes articles and interactive content that they’ve published on their blog. 730DC separates its newsletter into three main parts. The first, “What to Know,” highlights two to four local news stories, which the editors summarize for easy reading. The main goal of this section is to keep DC readers up-to-date about local news, having to find the stories themselves or read them in full. The second section, “What to Do,” highlights local events in DC, from startup openings, to cultural events, to new museum exhibits. This portion is divided by day of the week and includes a series of links to the event sites to make it easy to register and learn more. The first article in our series on email marketing explored how to determine which metrics to track based on your organization’s overarching goals. Our survey found that 25% of organizations ranked subscriber list growth as either their first, second, or third most important metric. These findings reveal an ongoing trend – to gauge email success by the size of the subscriber database, instead of how many people actually interact with your emails. “Too often we focus on stats that don’t really matter or can be fuzzy,” said Barber of barber&hewitt. When it comes to tracking email metrics, Loyal, Ceros, and 730DC value click-through rate, open rate, and engaged leads far more than subscriber list growth. “We want people to actually care about what we’re writing,” said Welch of Loyal. For Community.is, the click-through rate trumps the open rate because the main goal is to get readers to engage with the content being shared in the newsletter. “I want people to enjoy our content and to find it valuable, so I don’t care how many of them open our newsletter,” Welch said. Because of its unique layout, 730DC tracks open rate most closely. Although the “What to Know” section links out to news articles, the editors aim to summarize the stories succinctly enough so that readers don’t have to navigate to the article itself. On the other hand, the “What to Do” section encourages readers to click-through to the events pages. “If we’re doing a good job of writing blurbs, then people don’t necessarily need to click through to benefit, but they should be clicking on events,” said Higgins of 730DC. 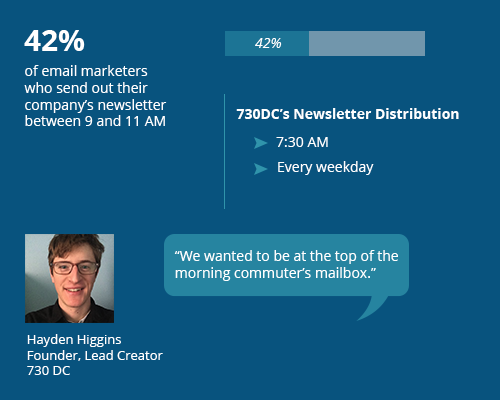 What can this data and these three case studies teach you about email marketing? 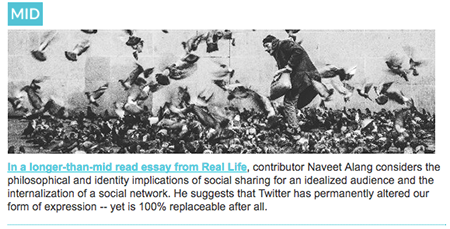 Newsletters are important for building an engaged audience and educating them about your brand. The best way to do this is by sharing valuable content. No rule dictates when to send out a newsletter. It all depends on audience behavior, so determine the days and times when your audience reads emails and schedule distribution for that period. Email personalization should be a priority for all email marketers, and it goes far beyond looking at demographic characteristics only. 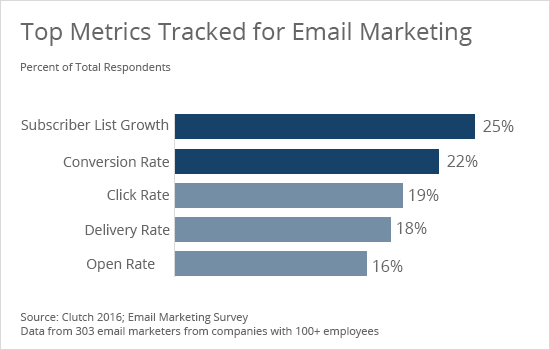 The most important email marketing metrics track audience engagement, not growth. 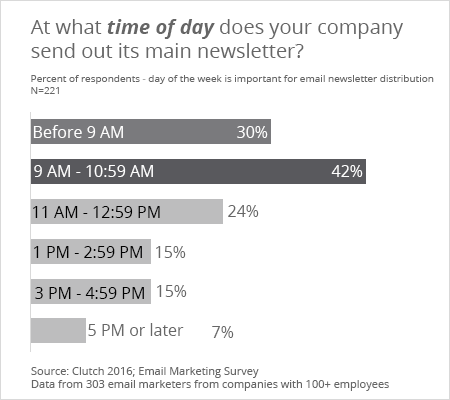 Data comes from Clutch’s Email Marketing Survey 2016. The study included 303 respondents who describe themselves as either expert, advanced, or intermediate email marketers. They work at companies with more than 100 employees, with 47% representing companies with more than 500 employees. 31% work for business-to-business (B2B) and 69% work for business-to-consumer (B2C) companies. You can find the first part of our email marketing research here: "How to Overcome 3 Common Email Marketing Challenges."